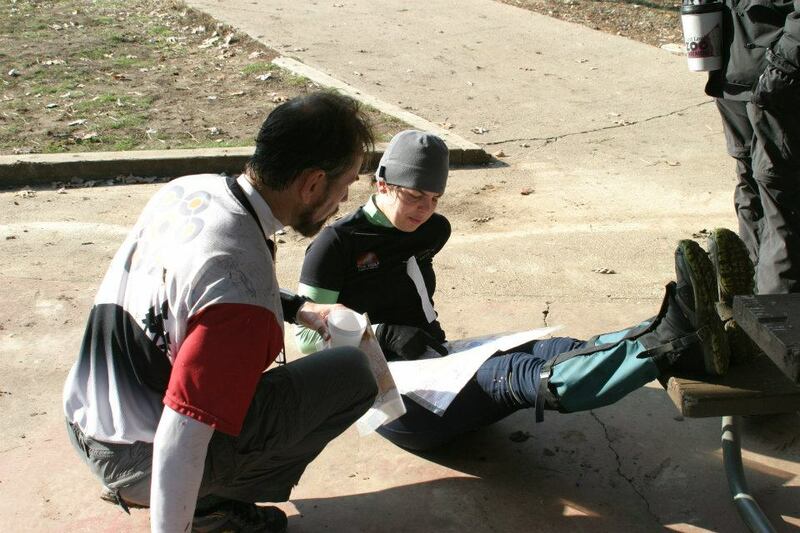 Now here's something you don't read everyday: a race report from an orienteering event. And even more rare, this is a long-distance, mass-start orienteering race (also known as a goat). Don't you feel lucky? 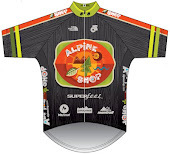 To start, yes, I raced this on a back-to-back weekend, with Saturday being Pere Marquette Endurance Trail Run (7.5 miles of elevation and high heart rates), and Sunday being my first attempt at the Possum Trot. Much like PMETR is to trail running, the Trot has turned into an institution of high-caliber orienteering, drawing talent from across the midwest (Minnesota, Colorado, Kansas, Missouri, Texas, and Ohio, among others), all vying to win the coveted Dead Possum. Who wouldn't throw down for the chance to win a stuffed animal? Not this girl. I drove over to Kansas City with another SLOC orienteer (and also Pere Marquette finisher) Eric B and his daughter. The company makes the drive go quickly and soon we are eating pizza with other orienteers at the PTOC Christmas Party. We crash for the night at the home of the race director and I don't sleep particularly well since my hamstrings are threatening to seize at every move. Morning brings a pot of my favorite breakfast, steelcut oats, which I devour and start getting my gear together. My mind isn't really functioning so I just throw everything in my bag and take the whole thing as we drive to the park for the race. There, I spend more time reading my clue sheet and less time warming up than I should have, and pretty soon it's 8.45a and I don't even have my shoes on. Yikes! I half-listen to the pre-race announcements as I arrange my gaiters/gloves/hat/HR monitor/compass/hydration tube/etc and pretty soon we are in an open field with maps, face down, on the ground in front of us. The race director yells "GO!" and 50 orienteers flip over their maps and start jogging, and then almost 90% of the field turns around and sprints the other way. I'm #48 with the yellow CamelBak. Photo by Bill L.
My map interpretation speed isn't that fast so I just become pack fodder and follow. I'm still trying to make sense of the map when we shoot through a small woodsy patch in the middle of a large field, and my inattention causes a huge faceplant onto a fallen tree. Ugh. Of course my much-abused left knee takes the brunt of the fall and my HR strap falls down around my hips. Thankfully that's all the damage I can feel, and the pack is still in sight, so I hustle to catch up. The run to 2 I spend trying to read the map for potential skip options, and I come up with 7, 20, 21, and 23 as possibilities. I'm too inexperienced to really make a good call so I decide to skip 23 for sure (it just looks nasty) and wait on the others. First 9 controls of PTXV. I follow the crowd to 2 and then take the low route to 3, trading spots with Molly of WEDALI. I know she's a superb athlete and I guess that she is a good navigator as well, she might be another good person to latch on to. On the way to 4 I pass Jeff of Alpine Shop, but he's going slowly and in the wrong direction. I ask what's wrong and find out he's lost his compass. Huge bummer for him! Going into 5 I'm still with Molly and her fellow MNOC member Peter, although after punching he announces that 6 is his first skip and jettisons down the road. I think it's too early for me to skip so I contour across the spur to 6. I hit it easily enough and on my way to 7 I get distracted by another orienteer absolutely flying perpendicular to me on a trail. I assume he's ahead of me, and going to 8, and a quick peek at the map reveals 7 would make a good skip. So I change direction and follow him down the trail. After 50 meters of re-calculating my route, I realize that 7 might not be such a good skip so I TURN AROUND and head towards 7 after all. I hit the road way high and have to backtrack. Fortunately, 7 is warm-blooded and I find it quickly after getting myself close to the circle. I don't dwell on my terrible race strategy as it will only make me slower. The route to 8 is fairly simple, and by the time I make it to 9 I am in a group of about 5 other people. I take the low, trail route from 9-10 and use the easy running to decide on 20 as my second skip. I feel accomplished that I have identified two decent-looking skips still in the first third of the race. I'm a real orienteer! I lead the pack into 11! I know what I'm doing! Then, inexplicably, I decide that I've had enough of pack running and that skipping 12 might send me ahead of the bunch. I abandon 12 and cruise off down the road to 13, again re-calculating my route. Again, realizing that 20 is a better skip. Again, TURNING AROUND and hustling to catch up with my former pack to on the way to 12. I vow to quit changing my mind and just stick to the original plan, however half-brained it may turn out to be. 13 is the first water control (orienteering's version of aid stations) and it reminds me to start eating my Honey Stinger chews. The caffeine in them seems to help my mental acuity and my route to 14 is slow but clean, and then I skirt semi-mapped vegetation boundaries on the way to 15, still in the company of a few other orienteers. The next 6 controls (remember I'm skipping 20) of PTXV. 16 is another hard effort uphill but the open terrain makes for easier running. I decide to use the powerline as a handrail for 16-17-18 and it works like a charm. Bill is hidden in the brush taking of photos of 17, but I don't acknowledge him since I'm concerned about the weird-looking 18. Thankfully, I needn't have worried since there is a new/unmapped mountain bike trail that leads me the correct direction, plus this control is also warm-blooded so I punch with ease. 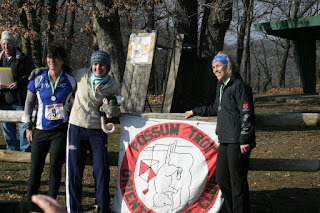 The run to 19 puts me into a small group with 2 other women and I have no idea if they are in the full or short possum. Either way, I had better run hard to finish this thing. I am SUPER careful on my way to 21, making sure I'm on the correct part of the trail. The control is lower than I expect but I trust the map and keep going until I find it. towards the end of PTXV. After nabbing 21, I gut out the hike up and over the ridge to 22, descending carefully to make sure I'm in the right spot. I am, and then it's time to execute my second and final skip by running up the creek bed to 24. Now I am running in the vague company of 2 other men but I have no idea how I'm faring in the overall or women's field. 24 to 25 is a cute pond-to-pond run which makes things easy enough except my legs have started to complain that they're not supposed to race this hard 2 days in a row. I try to shut them up by eating a few more Honey Stinger chews and they seem to accept a truce for now. I almost mess up 26 by running past it on the wrong side of the creekbed, but thankfully I turned to peek at a nearby runner and spotted it over my shoulder. Whew! 27 is another uphill push but the distinct streambeds make it easy to locate. On the way to 28, my legs reject the truce and inform me that the rest of the race is going to be a battle. They're not cramping, but just extremely stiff and tender. Walking is quite tempting and napping even more so. 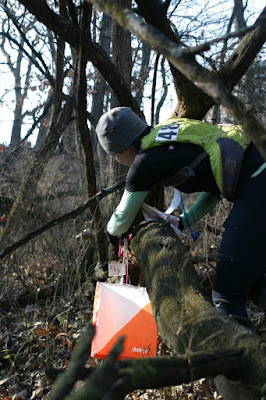 My typical zest for running in white woods won't be an option for the rest of the race. Clean nav is now my only hope of maintaining any position. A shot from earlier in the race at #17. Photo by Bill L.
The routes to 29 and 30 are very similar, just following my compass down and up the hills of Shawnee Mission Park. I decide 30 is my favorite control after I use a mapped rootstock to attack the faint drainage where the flag is discreetly hung. All that's left now is a quick uphill grunt then a big descent into the river flats for the final section of the course. The descent goes well although I am careful to not lose neither control or my place on the map. I find 31 with aid from the river's bend and then set out across the field to 32, which is another discreetly-hung but readable placement. The final controls of PTXV. On the way to 33 I notice my route is leading me towards an uncrossable stream. I am very proud that I noticed this and correct my path to use a mapped bridge towards the western side of the field. 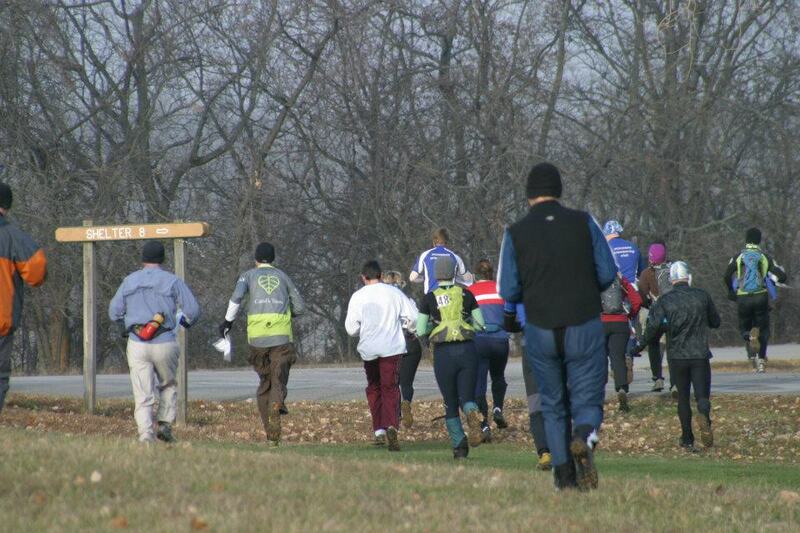 At this time I also notice I have an orienteer on my heels, Mike from OCIN, who I know is a very good navigator. It crosses my mind to let him lead me into the final 2 controls and then try to duke it out to the finish but pride gets the better of me and I try to do it all on my own. It works for 33 and then explodes in my face for 34, where I find myself way south of the path I need and have to correct fairly drastically. As I finally make my way to 34, the final control, I spot Mike clearing the top of the dam on his way to the finish. Crap! (Or should I say...DAM!) I punch quickly and try to make up any ground I can but my mistake is too much...I finish 16th out of 35 starters. Immediately post-race. Legs up, re-hashing route choices. Photo by Bill L.
The coveted dead possum is mine! Photos by Bill L.
I end up winning the women's division of Possum Trot XV. I had no clue I was even in the running for it and it's extremely gratifying. Molly is second and another MNOC member, Erin, is third. We make a happy podium by the PTOC flag. Erin, me, flag, Molly. Photo by Bill L.
No one really hangs around since we all have long drives homeward and it's chilly. So I grab a few delicious chocolate chip cookies and head back to the Neuberger's house with Eric to clean up and re-pack for the ride to St. Louis.